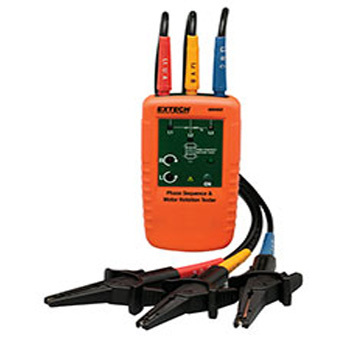 Extech 480403: Motor Rotation and 3-Phase Tester – Infinity HVAC Spares & Tools Pvt. Ltd. Indicates rotation direction of the motor. Determine rotation of a motor without contact. LEDs indicate phase orientation (clockwise or counter-clockwise) and whether each of the three phases is live. Easy to use alligator clips with wide jaws.